In another shake up in Washington, Rex Tillerson is out as the Secretary of State and President Trump said he will promote CIA Chief Mike Pompeo to the position. Trump has nominated Gina Haspel to replace Pompeo as head of the CIA. Haspel famously ran the CIA’s first black site prison in Thailand during the early days of the War on Terror. Haspel has tortured people, overseen the torture of people, and destroyed the evidence of said torture. A quick reminder—torture isn’t an effective method of intelligence gathering. We know this because of cables the CIA declassified describing the torture. In August 2002, the CIA captured Abu Zubaydah—former manager of a training camp in Afghanistan—and began to torture him at a black site in Thailand while Haspel was running it. The Senate’s infamous torture report also details the torture of Zubaydah while he was in Haspel’s custody. Subject began crying as he was told that we wanted information to stop operations against the U.S, the cables read. Subject was told he could stop the process at any time. Subject continued with his appeal that he has told all that he has and muttered ‘help me.’ Between 1250 and 1315 the waterboard technique was applied numerous times. Subject was put into a large box at 1317. To get a sense of Zubaydah’s treatment, the Senate report mentions his name 1,343 times in 712 pages. Excerpt from Senate torture report. 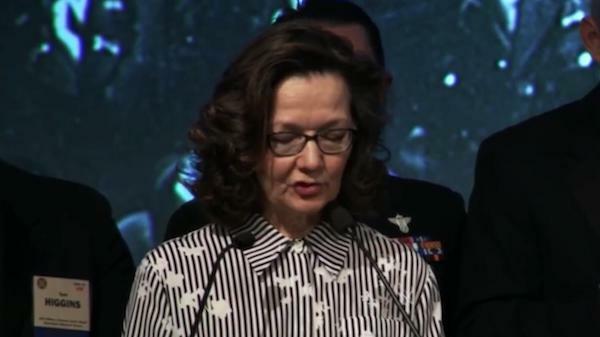 Haspel was the head of the Thailand site during Zubaydah’s torture, a position referred to in the documents as the “chief of base.” Repeatedly in the cables, the chief of base or COB takes a direct role in the torture. “On July 15, 2002, a cable providing details on the proposed interrogation phase stated that only the DETENTION SITE GREEN chief of Base would be allowed to interrupt or stop an interrogation in process, and that the chief of Base would be the final decision-making authority as to whether the CIA’s interrogation techniques applied to [Zubaydah] would be discontinued,” the Senate torture report explained. At one point, the chief of base congratulated Zubaydah on a fine acting job and accused him of faking a mental breakdown under torture, according to CIA psychologist and torture architect James Mitchell. “Good job,” Mitchell wrote in his book, quoting the COB. “I like the way you’re drooling, it adds realism. I’m almost buying it. You wouldn’t think a grown man would do that.” Several former associates put her in the room at the time of Zubaydah’s torture. She signed many of the reports sent from Thailand to CIA headquarters in Langley, Virginia. We are a nation of laws and we do not wish to parse words. A bottom line in considering the new measures proposed is that [Zubaydah] is being held in solitary confinement, against his will, without legal representation, as an enemy of our country, our society and our people. Therefore, while the techniques described in Headquarters meetings and below are administered to student volunteers in the U.S. in a harmless way, with no measurable impact on the psyche of the volunteer, we do not believe we can assure the same here for a man forced through these processes and who will be made to believe this is the future course of the remainder of his life. Station, [DETENTION SITE GREEN chief of Base] and [DETENTION SITE GREEN] personnel will make every effort possible to insure [sic] that subject is not permanently physically or mental harmed but we should not say at the outset of this process that there is no risk. When torture was falling out of fashion, the CIA lost evidence of wrongdoing. The Agency had 92 VHS tapes of the torture of Zubaydah, who the U.S. believed was a high-ranking Al Qaeda official. They were wrong. He wasn’t, and the CIA lost or destroyed video evidence of his abuse.